…Riding, walking, riding, ranching, barrel racing, dancing, watching football, looking cute and otherwise being practical and comfortable! When Cavenders reached out to me about a sponsored post, I couldn’t say no. After all, I grew up shopping in their stores and always enjoyed the experience. It also just so happened, that I needed some new boots. Now, I’m not gonna lie: I’m kinda choosy about my boots. I need the top to be tall enough that they won’t get caught on my saddle stirrup fenders. The soles must be leather, because that’s the safest type sole for riding, because we all know I do plenty of that. And of course they must be cute, practical and stylish. Boots, glorious boots. A girl can never have too many pairs of cowboy boots. And of course Cavenders had something gorgeous, something exotic and something that screamed my name. 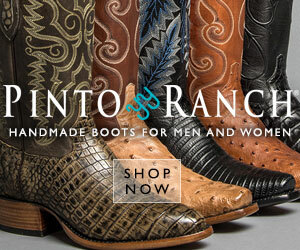 Plus, they’ve partnered with Old Gringo (every cowgirl fashionista’s favorite brand of dress boots — right?) for a line, made exclusively for them! I mean, are these things pretty or what? I love the details — the way the hides are stitched together. I love the pattern on the boot tops too – even though that’s rarely seen by anyone because I’m not a big tuck-your-pants-into-your-boot-tops-kinda-gal, it’s nice to know that they thought of everything when they designed and constructed the boots. One of the most important things for me, of course is that they’re super comfortable to ride in. And they are a big WIN in that department. The tugs at the top are thin and don’t rub on the inside of your leg, and nothing pinches! I really dislike change when it comes to boots — but it’s easy to ride in something new when they’re THIS comfortable! Make sure you visit Cavenders for your boot or western clothing needs — you won’t regret it, I promise. I sure don’t! Many thanks to Cavenders for partnering with me on this post. My feet thank you! Gorgeous! There is nothing better than a new pair of boots!